KIEV, Ukraine -- After being freed from a Russian jail, Ukrainian pilot Nadezhda Savchenko stands to emerge as a wild new force in Ukraine's already volatile politics. Ukrainian President Petro Poroshenko, right, looks at Ukrainian jailed pilot Nadezhda Savchenko during their meting in the Presidential Office in Kiev, Ukraine, Wednesday, May 25, 2016. Russia has released jailed pilot Nadezhda Savchenko, as part of a swap for two Russian servicemen imprisoned in Ukraine. Savchenko's adamant defiance of Russian authorities and the Russian justice system has made her a national icon, a widely revered symbol of courage and perseverance for a nation reeling from an economic meltdown and a devastating war in the east against Russian-back separatists. The 35-year-old's blunt candor and passionate ways pose a tough challenge to Ukraine's political clans, who have been locked in fierce power battles that go back decades. The prospects of more political infighting raises new threats to the stability of Ukraine — and would be welcome news for the Kremlin, which is eager to see its neighbor plunge deeper into turmoil. Savchenko's return home was a personal triumph for Ukrainian President Petro Poroshenko, who rallied international leaders to press Russia for her release. But even though he may have hoped her return boosts his sagging popularity, Savchenko's entry into politics is likely to challenge him greatly. Many Ukrainians hold Poroshenko responsible for a moribund economy, a dramatic fall in living standards and his failure to stem rampant official corruption. Some hard-line nationalists, including members of volunteer battalions who fought in the east, see the president as too weak in defending Ukraine's national interests. They have vowed to block any legislation that would give broader powers to the separatist eastern regions in line with the February 2015 Minsk peace agreement brokered by France and Germany. Some nationalist forces have seen that deal as betrayal of Ukraine's interests. Poroshenko has defended the Minsk agreement and accused Russia of failing to honor it as sporadic clashes in the east continued despite the truce. Savchenko, an ardent nationalist captured by separatists in June 2014 while she acted as an artillery spotter for a volunteer battalion in eastern Ukraine, will likely take an unflinching stance on the war in the east and oppose any compromise with Russia-backed rebels. She also is likely to become a voice for masses angry with endemic corruption, which has run amok despite official promises to eradicate it, eroding trust in the government and sapping the hopes raised by the 2014 ouster of Ukraine's former, Moscow-friendly leader. Even before Savchenko's return, Ukraine's ruling coalition was embroiled in bitter political infighting. Following months of jockeying, Poroshenko managed to replace Prime Minister Arseniy Yatsenyuk with his loyalist, Volodymyr Groysman. Still the battle left the parties led by Poroshenko and Yatsenyuk in a fragile coalition, united mostly in their desire to avoid an early election. Savchenko is already a member of parliament, voted in while she was languishing in a Russian jail. She has not yet talked about her political plans — but her return could consolidate those unhappy with the status quo and increase pressures for an early election. Yulia Tymoshenko, the former Ukrainian prime minister whose party got Savchenko into parliament in 2014 when her Russian ordeal just began, hopes now to emerge as the main winner. Tymoshenko, who spent 2 ½ years in a Ukrainian prison in 2011-2014 as the former pro-Moscow president sought to eliminate her as a political rival, expected a triumphant return to the political scene after his downfall. Instead, she saw her popularity dwindle as many saw her as a relic of the old political system. Since then, Tymoshenko managed to rebuild her popularity, riding the growing wave of anger with the anemic economy and official corruption. "Tymoshenko is pushing for new elections, and Savchenko's voice may help a lot," said Vadim Karasyov, an independent Kiev-based political analyst. Still, Tymoshenko will likely find it hard to control the unruly military pilot. 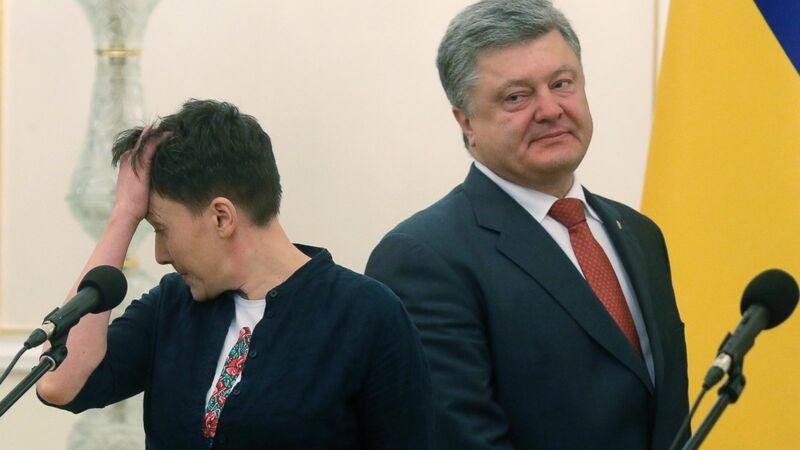 Savchenko, who is fully aware of her nationwide popularity, is unlikely to take a back seat. The tensions between the two were immediately visible Wednesday during a greeting ceremony at Kiev's airport, when Savchenko dodged Tymoshenko's attempts to kiss her and refused to take flowers from her. "Savchenko's uncompromising stance and her unpredictability would be a problem for both herself and for those who would try to use her," said Volodymyr Fesenko, head of Penta think-tank in Kiev. "Savchenko's charisma can unite the right and the ultra-right forces, which believe that the ideals of revolution must be defended," he said. "That scenario may trigger street protests and new parliamentary elections." As Ukraine seems ready to sink deeper into turmoil, one man is watching with glee: Russia's President Vladimir Putin, whose relentless pressure on Ukraine has been one factor crippling his southern neighbor. As parts of the Minsk peace agreement remain deeply divisive in Ukraine, the Russian leader could highlight Ukraine's failure to meet its end of the deal and push for lifting Western sanctions against Russia. The Kremlin could also point to Ukraine's political infighting to support its contention that the nation is dominated by nationalists who are eager to resort to violence and shun compromise. I have watched news on CNN how people warmly greeted Pilot Nadiya Savchenko at home and abroad, Ukrainians are happy for her and Ukraine, since Nadiya is the one who will advocate for political rights and freedoms of people. That is not right when not-at-fault pilot or any other political prisoners should be kept in prison and then exchanged with the real offenders. Political expert at customwritingz.net site, James.